This past month, people across Britain marched in solidarity to demand we help more Syrian refugees and also in protest against sending air strikes in an attempt to stop ISIS. The UK government, however, still decided to bomb Syria. With so many miscarriages of justice happening across the planet, we have witnessed the once voiceless stand up and be counted in demonstrations against oppressive infrastructures and systems. From Ferguson to Cairo, Cape Town to Palestine, the world has become a centre stage to uprisings of revolution and demonstrations by the brave few. Police brutality, climate change, institutionalised racism, human rights, war, and cuts that push people into poverty have been a revolving door of issues to get out in the streets and have your voice counted. 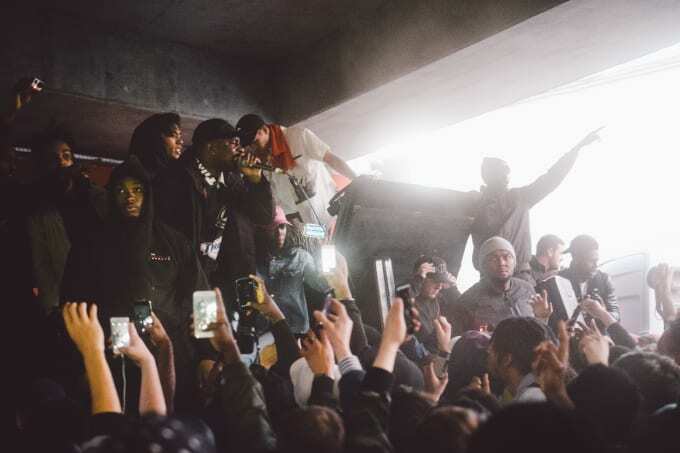 While there can never be any justice without peace, Complex has collected 10 grime and hip-hop tracks to excite, motivate, and even refresh some of the regular chants in your protest. We've mixed it up with some exciting tracks that inject an uplifting aura, and a few politically-motivated lyrical tracks to keep the protest on topic.